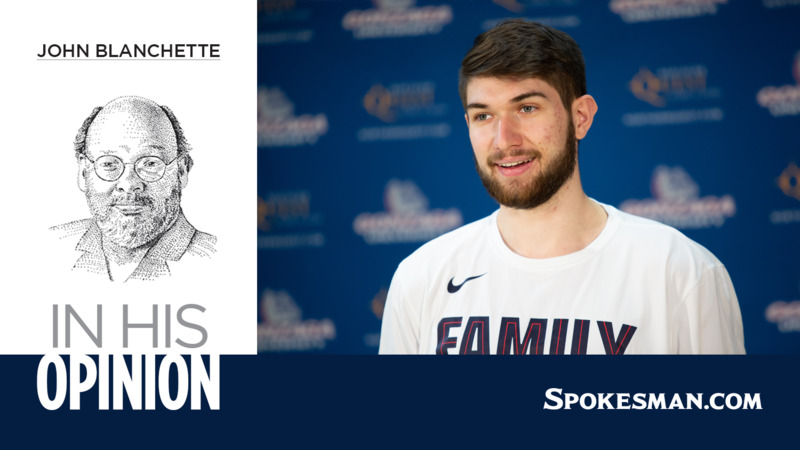 So in case the Gonzaga Bulldogs still didn’t have that top-line feeling back after Terrible Tuesday, they were given an imprimatur on Selection Sunday. And they had nothing to do with it. Well, OK, they had something to do with it – plenty, really. Thirty wins worth of something, including over Duke at full Zion strength, which seems to be the only college basketball metric anybody cares about. The most dominant regular-season run through their conference in history. Eighty-six consecutive days of unbeaten basketball. As a body of work, it was Charles Atlas-y if not the Incredible Hulk. But the fact is, they were still 40 minutes from a No. 1 seed in the NCAA Basketball Tournament as late as Sunday morning – when they didn’t have a game scheduled. And then Auburn gave Tennessee a 20-point noogie in the SEC championship game. Gonzaga’s 31st win, as it were. Nevertheless, it remains “pretty cool,” as Zags forward Killian Tillie put it. “And I think we deserve a No. 1 seed,” he said. So did the selection and seeding committee – to a point. “Had Tennessee won today we would have made the switch and put Tennessee on the 1 line, because they were playing so well,” said Bernard Muir, the committee chair and athletic director at Stanford. Wait, the committee held the Vols’ loss to Auburn against them – but didn’t hold the Zags’ tumble against Saint Mary’s against them? Welcome to the messy business of making Bracket Sausage. The Bulldogs have been going through this for more than two decades now, and they have graduated from double-digit ambush artists to dismayed mid-level seed to sniped-at elite. The howling from the unselected and mal-seeded that accompanies each year’s announcement is something Few pretty much tunes out now, listening only to committee chairs for any signals about what kind of scheduling gets rewarded. This year, the sniping was pretty muted. Belmont got an at-large bid, thrilling mid-majorphiles. UNC Greensboro – which sweated Gonzaga something crazy a year ago – got knocked out when Oregon won the Pac-12 Tournament. North Carolina State made a stink, and then wasn’t even good enough to get a top seed in the NIT. And, yeah, there was some huffing about the top two lines – which may have been as indistinct as ever. “You could have flipped a coin on a bunch of us,” said Few. “In our case, we ended up playing several other teams that were up for consideration, and I had a chance to watch most of the others, and they were all deserving and really good. Muir acknowledged that Michigan State’s win on Sunday vaulted the Spartans over Kentucky to No. 6 on the seed list – and temperatures spiked when they wound up in the same region as Duke, the overall No. 1. Gonzaga actually got the “last” No. 2, Michigan, in its region, but to get there the Zags will likely have to beat Syracuse, a particular NCAA nemesis, and Florida State, which eliminated them a year ago. Don’t think either of those possibilities don’t have the fan base in a dither. “What are they doing on the 8 line?” Few wondered of the Orange. Of course, out there in Outraged America, people wonder about the Zags on the top line. Tennessee had that head-to-head win. Michigan State had more Quadrant 1 wins – 13 – than anyone in the country. Kentucky, well… gulp. Then again, while it’s not Zion-comparable, it should be remembered that two of Gonzaga’s three losses – to the Vols and North Carolina – came before either Tillie or Geno Crandall could join the lineup. Well, that’s where Auburn kept them, anyway. Published: March 17, 2019, 8:58 p.m. Updated: March 17, 2019, 9:58 p.m.